I'm very satisfied with the quilt set. The quality is good and the color is as shown in the picture. The print looks better in person. It's the perfect quilt for spring and summer. Decorate your entire bed at once with this three-piece quilt set by KD Spain. The quilt features a modern patchwork design that brightens up any bedroom, while the reversible shams allow you to switch between patchwork and geometric designs to match your mood and decor. This 100-percent cotton quilt set is machine washable and easy to care for. Smaller items in this set are often folded into the larger ones. Please unfold the set completely to find each individual item. I love the colors and patterns in this quilt because I am trying to match the color of the walls, however I was disappointed in the quality for the price they are charging. The quilt pattern is printed on, not actual pieces, and it is very thin. It's a good weight for summer, but I'll need to get something else for winter. The size also seems a little skimpy and the pattern is not centered on the quilt. If you're the least bit OCD, don't buy this. This is a very nice quilt. Unfortunately, it is not the size stated in the description. It is supposed to be 90 x 90. I don't know the size it was when it was received, but after washing it is only 81 x 78. Also, the zipper on one of the shams separated and no longer closes. It looks very beautiful on my king size bed. Love the fact that is 100% cotton. I love that this quilt set is really gender neutral - perfect for a guestroom. The size is very generous, and love the hidden zipper on the pillow shams so they are truly reversible. I'm really happy with this purchase. The colors and print were exactly as seen online. The quality seems good, but I have not yet washed it. It's lighter weight than I anticipated so I'll use it as a summertime quilt. I do wish there were additional options for extra shams and throw pillows but I knew when I ordered it there were no add-one available. Overall, very happy with this selection. 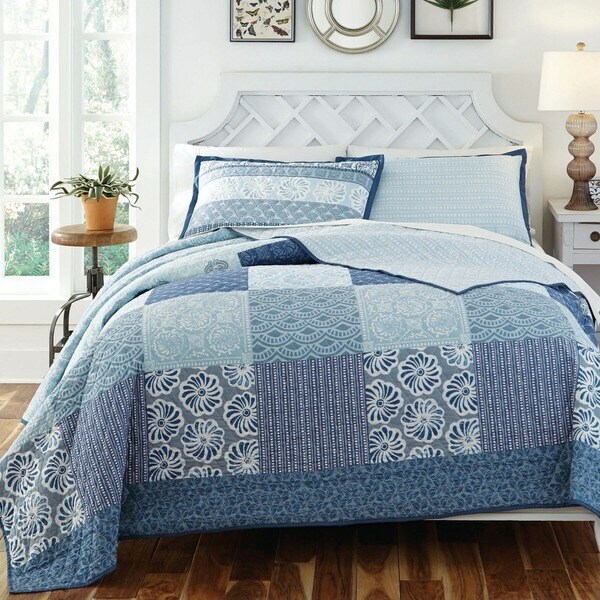 Really love this quilt and sham set. Looks lovely in my newly painted room. This set arrived in gorgeous shape, just like the pictures online. We are sleeping under this bedspread set and I bought some extra pillows to add extra flare to the bed. I'm very happy with this product!! Love this quilt set. It looks so fresh and crisp on our bed. Good quality, washes and wears well. We love it! Got two of these for the twin beds in one of the guest rooms. Our grandkids love the color, and they are warm enough for cool nights. Will need an extra blanket if used in the winter months. They brighten up the room! Love it. It looks great and seems to be well made. Colors are as pictured. Well made. A lightweight quilt that is perfect for summer. Size is nice, not stingy in length. King size shams fit perfectly. I am happy with the quilt. Good to put on the bed for spring and summer. Bought this quilt for our beach house rental property. Excellent quality - nice pattern and colors. I'm always a little disappointed when I think that I'm getting a patchwork only to find out it's a print fabric. My daughter picked it out for the colors, so I'll go with it. If she's happy, I'm happy. "What are the measurements of the queen size?" Hello Janbo, the Queen is approximately 90 inches wide x 90 inches long. Thank you for shopping with us. "What are the measurements of the king"
Hello Champion, the quilt is approximately 108 inches wide x 90 inches long. Thank you for shopping with us! "How much does king size quilt (not including shams) weigh?" Hello spikebluer, the king quilt is approximately 9 lbs. Thanks for shopping with us! I liked the colors and the design of the quilt. I think it will look nice in my bedroom. "Are the colors of the Kate Spain Horizon quilt shown accurately on Oversock? The colors of the same item on other sites are much more muted." Hello refinedshopper, we try to represent the colors of our products accurately. Unfortunately, due to the difference in monitor colors we cannot guarantee that the color will match exactly what you see on your screen. Thank you for shopping with us.